Browse all lot sizes for SilverTowne Second Amendment 1oz Silver Rounds. Throughout recent history, the language of the Second Amendment to the Constitution of the United States of America has been interpreted differently by different people. But there is no denying its importance in helping to shape this great nation. Without the right to bear arms, Minutemen would have had a much more difficult time supporting American forces during the Revolutionary War. Custom minted at the SilverTowne Mint in Winchester, Indiana in .999 fine (pure) silver, the obverse of the design depicts a minuteman raising, aiming and firing his rifle. Arcing around the top are thirteen stars representing the original thirteen colonies. The language of the second amendment is then inscribed around the outside circling all around the edge. Also inscribed is the year 1791; the year the ratification of the first ten amendments to the United States Constitution was completed, forming The Bill of Rights. Then the reverse features an American Bald Eagle, gazing proudly from behind a depiction of the Bill of Rights and the Constitution of the United States of America. Around the top of the eagle are 21 rays representing a 21-gun salute, and around the bottom are two olive branches. 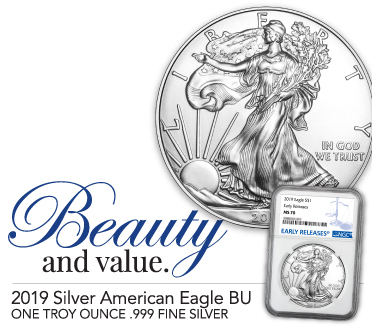 The weight and purity designations are also included on either side of the eagle; including .999 FINE SILVER and ONE TROY OUNCE. Singles will arrive in individual plastic flips with increments of 20 pieces arriving in a protective plastic tube. See all available lot sizes of 2nd Amendment 1oz Rounds. 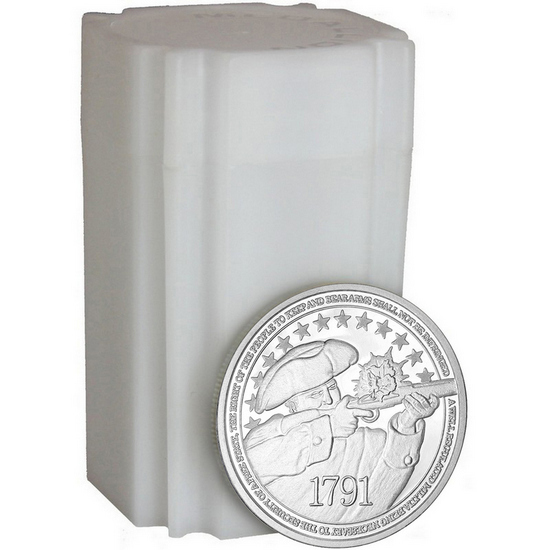 The 2nd Amendment 1oz .999 Fine Silver Medallion 20pc is a SilverTowne Mint Minted Bullion Product. Located in Winchester, Indiana, The SilverTowne Mint has been manufacturing quality Silver Bullion produced with the Highest Quality Standards since 1973. When purchasing the 2nd Amendment 1oz .999 Fine Silver Medallion 20pc on SilverTowne.com you are buying direct from the source! The 2nd Amendment 1oz .999 Fine Silver Medallion 20pc is a SilverTowne IRA Approved Product. 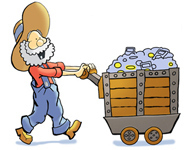 Collecting physical silver, gold and other precious metals is a great way to diversify your holdings. For more information on adding precious metals to your portfolio visit SilverTowne.com/IRA or call 1-877-477-2646.
with a minimum cart total of just $99 (when shipping to a continental United States shipping address). 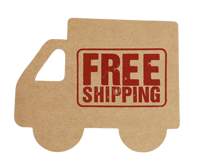 SEE ALL ITEMS THAT SHIP FREE WITH NO MINIMUM ORDER! From humble beginnings in 1949, SilverTowne has grown to be one most trusted bullion numismatics dealers in the US. 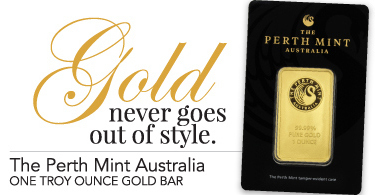 In addition to a large selection of modern coins from mints around the world, we offer silver bullion bars and rounds of our own from the SilverTowne Mint. Many of these designs are exclusively ours, so buying directly from the source is a convenient and easy way to collect and keep your stacks growing!